The warmer weather has sparked our desire to hit the open road and do some exploring. 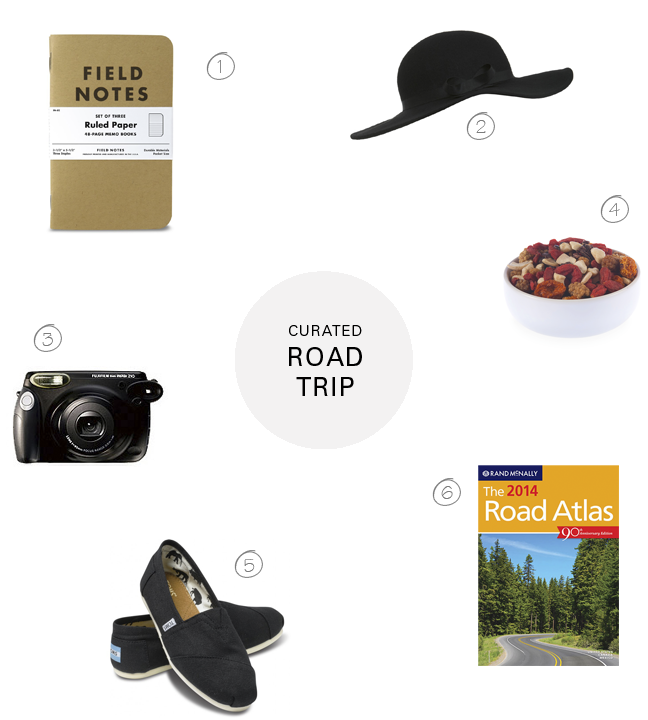 Here are a few of our road trip essentials. What are some of your must-haves? Where will your car be taking you this year? 1. Field Notes Journal: Bringing a journal is a great way to remember all the awesome experiences you have on the trip. Take some time to write and draw each day. // 2. Floppy Hat: Just because you might be sitting in a car for awhile, doesn't mean you shouldn't look good doing it! // 3. Polaroid Camera: Want instant photos during your trip? Grab this polaroid and shoot away! We love the wide format which is perfect for landscape shots. // 4. Trail 3 Berry Cacao Chashew Mix: Stock the car with some of your favorite snacks. This organic trail mix is the perfect high-energy bite to eat. // 5. Toms Classic Canvas Shoe: Don't get stuck in the car with shoes that make your feet ache. Toms are both comfortable for the car ride and durable for those unexpected highway exit adventures. // 6. Road Atlas: Along with your smartphone, bring an atlas. Believe it or not, sometimes Google Maps has been know to steer us in the wrong direction. Plus you can find coupons, highlights of small towns, smartphone scan tags with up-to-the-minute information and discounts, and more! *This is not a sponsored post. This is simply a collection of items we love!